END OF LIFE is exactly that, the time very close to the end for five people, Sarah Grossman, the spiritual teacher Ram Dass, Carol Virostek, Doris Johnson, and the artist, writer, and performer Matt Freedman. They discuss life, death and carry on in their final days. Decidedly not for all audiences, the minutes long takes where nothing much sees to happen are going to bore some, while others are simply not going to want to go to a place where death is hovering. Yes, the people on screen are very much alive but it's clear that their time is limited. And even if you don't mind seeing the film you may find yourself reliving, as I was, the death of a loved one. Ultimately END OF LIFE is challenging viewing. And yet for all that it shows, or tries to show, I'm not sure if it achieves what it wants or what it's purpose is. What exactly am I supposed to get out of this film? I really don't know. The film is put together in such away as to imply that it is going to impart some great wisdom about dying but I see nothing other than pretentious framing of some of the final moments of five people. The write up for the festival talks about the film showing the "actual work of dying" but having seen the film I'm still not certain what that term means. 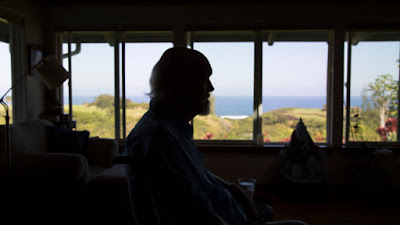 Is it the coming to terms with death, as Ram Dass discusses or fighting, as Matt Freedman does by performing and discussing or is is simply laying in a hospital bed waiting for the end? I'm not certain. The write up talks about "the communions with the mystery of being enacted by the dying" which would seem to imply that some secret will be revealed, but if it there was I never saw it. I suspect that I am coming off as pretentious myself, inferring that I am somehow above it all, but I'm not. What I am trying to say is that what should have been and could have been a document about how people face their end has been rejiggered and redressed to try and make something "meaningful" and in a way mysterious. I don't see the meaning just long sequences that didn't really seem to have a point. When you get down to it I didn't see much in this film that I hadn't gotten in other, better, films. I'm sure that the film will have it's champions, but I'm not going to be one of them.